Focus blending refers to the practice of bracketing images with different points of focus and then blending them to achieve super-depth-of-field. A few weeks ago I wrote an article for Photofocus introducing the concept. It’s had great response so I thought I would also post the link here on my blog. You can read the article here. I just recently purchased your book, Lightroom2. I notice that many of your beautifully printed images are done with small aperture settings. For years, I have shot many landscapes at f22. This seem to go against the grain of conventional wisdom. Many serious photographers refer to a sweet spot in the lens, about f8 or f11. I shoot with Minolta professional glass; all of my lenses are 2.8s. now I’m using them digitally with a Sony A700 body. “Thank you very much for your email, and for purchasing my Lightroom book. I will be happy to answer your questions re: apertures. I’ve been seeing a lot of tips floating around about photographing fireworks. Many make it seem difficult and mysterious. Time to get back to basics. More light = shorter exposure. Less light = longer exposure. Capturing fast action = shorter exposure. Blurring long motion = longer exposure. … where “exposure” is a combination of aperture and shutter speed. But when the bombs really start glaring, you need faster exposures to capture them. Otherwise, you will end up with a blurry mess of overexposed shots. "I am enjoying your book. I have read a few on LR 2 and I am learning plenty from your book and enjoy your style and photos. I do have a question with the photo that was used on the cover and included just before chapter 6. The shot indicates it was 13 seconds but I see a man in the lower left hand corner and I am try to understanding how he was still for that time. Could you please help me understand that. Thank you." 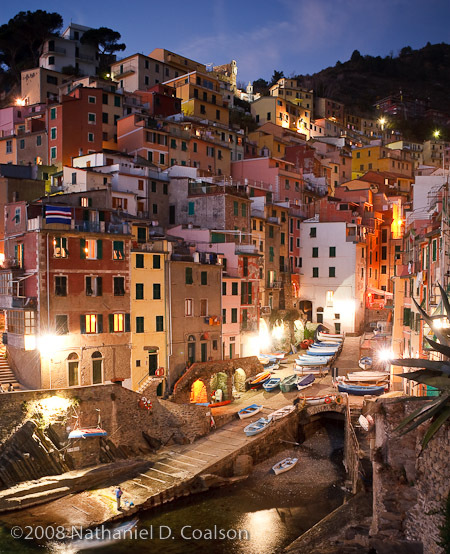 "The photograph on my book cover, of Riomaggiore, Cinque Terre, Italy was made at dusk. The sun had already set. I always prefer to use as low ISO as possible to minimize noise. The exposure settings I chose resulted in an shutter speed of 13 seconds. I had been at this spot for nearly an hour, watching the light change and people coming and going. As the sun went down, fishermen started coming into port, getting off their boats at the spot you see in the photo. To make this picture, I set up the camera exposure, focus, etc. (and checked some captures on the histogram) and waited until a fisherman was coming into the scene. Over the 13 seconds, probably 8 or nine seconds were with him approaching the dock, moving quickly and getting out of the boat. Due to the low light and long exposure, these events did not register on the camera sensor. When he got out of the boat, he stood still for a few seconds, smoking a cigarette. This is when he was recorded in the image. On very long exposures, elements quickly coming in and out of the scene will not be recorded in the exposure, because their presence is outweighed by the forms that are constant in the longest part of the exposure. You can reproduce this effect in low light, say, at dawn or dusk, in a public location. Get you camera set to produce a proper exposure of 10 or 15 seconds, in an area where you expect people to wander through. Do a bunch of exposures, and on later evaluation, you will see that some people show up, others don’t, and some seem in a state of suspended animation, though the world is moving around them. This is because they stood relatively still throughout the exposure, while other people came and went at varying speeds. This is a good exmaple of the kind of imagery I seek to consistently produce — using one single exposure. Let the camera do the work. I hope this gives you the explanation you wished for; please feel free to write back if you have any other questions."